The goal of your Maple Ridge optometrist is to partner with you on your dry eye treatment to help you feel better, see better and to keep your eyes from getting worse over time. We want to keep your eyes healthy, comfortable and seeing well over the long term and are here to provide you with the answers and solutions to your specific symptoms of Dry Eye Disease. Dry Eye Disease (DED) is a chronic condition where the body cannot produce an adequate amount or the proper composition of tears. It can also occur because the tears are not of the correct consistency and/or they evaporate too quickly to keep your eyes healthy and your vision clear. It can be caused by multiple factors and is accompanied by inflammation of the surface of the eye that leads to pain and can cause potential damage. Contributing factors include age, gender, certain systemic medical conditions, such as diabetes, contact lens wear, glaucoma treatment and some oral medications. DED can affect anyone, but there are certain risk factors to be made aware of that make it more likely that the symptoms you're experiencing are the result of Dry Eye Disease. Though Dry Eye Disease is a chronic condition and cannot be cured, your comfort can be improved and your eye health maintained through the appropriate treatment. Each case of DED is unique and the right treatment for you is dependent on the specific factors contributing to your DED. 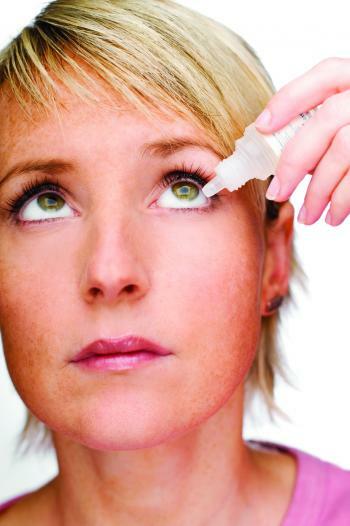 Following a consultation and initial diagnosis for Dry Eye, your optometrist will prescribe a treatment regimen appropriate for the specific factors contributing to your dry eye.